Jack and Annie are off on another Merlin Mission. This time, Merlin has sent them to rescue a beautiful, magical creature, the unicorn. But when they land in New York City during the Depression of the 1930s, Jack and Annie are confused. Where will they find a unicorn in a big city? And what about the blizzard that's burying New York in snow? Can Jack and Annie make their way through the windy streets, find the unicorn, and maybe even bring some hope to the people of the great city? Only once in a blue moon do all the right elements come together to make magic in such a special way. 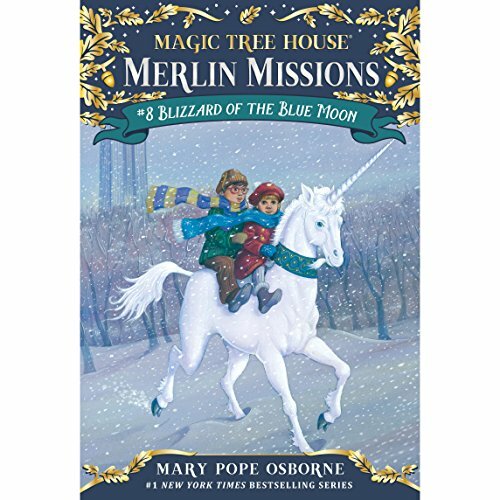 In Blizzard of the Blue Moon, Mary Pope Osborne takes listeners to one of her favorite cities in the world, and shares its sights and sounds and some of its greatest treasures. This is one of my granddaughters favorites in the Jack and Annie series. I purchased all of them last Christmas for my grand daughter (then 7). She's listened daily - while picking up her room, laying by the pool last summer, entertaining her young friends with the stories which I put on my old iPhone-turning it into a iPod for her. Especially nice if you have the books to go with them, your child can 'read' along with listening to the stories...this is how my middle son learned to read when he was 5-I'd read to him and his older brother and my son would follow the words...I was amazed at how quickly he learned to recognize common words and he went to 1st grade able to read. Now, at 8, shes ready to move up from Jack and Annie and I downloaded a YA Sci-Fi trilogy for her .... David Weber's prequil to Honor Harrington's 'Honorverse' which has an 11 year old as the mail protagonist...an excellent move up from the excitement from Magic Tree House. Meanwhile if you can grab these on special as I did, it's a good entertainment for your young children on trips or if they want 'just another story' at night and you are tired of reading. As my daughter and I are both totally hooked on audio books,this gives us time to listen to our own stories. I think Osborne is a poor narrator, however, and another reader ought to have been selected. She's often difficult for my grand daughter to understand.